I've written several posts about great free seminars around town - places that offer worthwhile one-night workshops or classes, but for those of you who are looking for a little more (such as homework, grades and even a degree), then read on. SUNY, CUNY or state schools are the way to go for serious learning with out shoveling out serious cash. Being a NY State resident allows you to attend these state schools for about a quarter of the price you would pay at a non-state school. 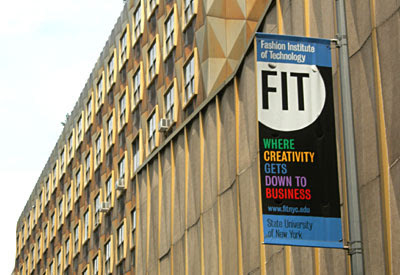 For the past five years I've taken various design courses through the Fashion Institute of Technology (F.I.T.). While not as fancy a name as Pratt, Parsons, SVA or NYU I've taken similar design courses through F.I.T. at a fraction of the cost. I've taken both semester-long, for-credit courses as well as non-credit, continuing-education courses through F.I.T. Usually one course will cost somewhere between $200 - $300. The semester-long, for-credit courses are your best deal, offering 15 full classes, graded assignments and final projects. They have an array of class schedules (both for the credit and non-credit classes), enabling you to work a full time job and attend night classes. Conceivably you could slowly earn a degree if you took enough of the credit classes. The non-credit courses can be packaged and combined allowing you to earn various professional certifications. There are also many other state schools around town, though I have only attended courses at F.I.T. The teachers are great and very knowledgeable and it has always been a good investment of my $250. F.I.T. is located on 7th Ave. between 28th and 26th streets. Of course New York has its high end gourmet restaurants with celebrity chefs, but what really makes this city the food capital of the world is that it offers hundreds of ethnic cuisines from around the world. The fact that it is not uncommon enjoy Moroccan, Ukranian and Peruvian dishes - all within a 2-block radius - makes dining in New York unparalleled. NOTES: Tastiest, heartiest German food I've found. Pair with a good beer. NOTES: Though not a vegetarian restaurant, their vegetable-special dishes - such as chick peas simmered in butter and garlic, or pumpkin with rosemary and berbere - are delicious! Be sure to go with clean hands. ADDRESS: St. Marks Place between 1st and Ave. A, and other locations. NOTES: Simple, healthy, inexpensive and tasty. The hummus is excellent. Try a side of the health salad with your hummus dish and wash it down with a cold glass of their lemonade with fresh mint. NOTES: Good value - quality Japanese food at reasonable prices. NOTES: Excellent sushi you can afford. Why pay more at Nobu? NOTES: Though not on the cheap end, Il Buco has the best Italian food I've tried in the City. Atmosphere is also excellent. Good place to take your date. NOTES: Better than many of the other restaurants in Little Italy, nice outdoor seating and good prices. NOTES: Nestled among the Indian restaurants of "Brick Lane," Zerza has delicious Moroccan fare, a cross of something between French and Middle Eastern. ADDRESS: 34th Street between 2nd Ave. and 3rd Ave.
NOTES: Big servings, good prices and tasty (if greasy) food. Great takeout food for a party. Below are my three picks for Indian. Also for more info on Indian, read post "Curry Hill vs. Brick Lane"
ADDRESS: 6th Street at 1st Ave.
NOTES: The place is SMALL, so crowds are always a problem, but it is worth the wait for these delicious arepas. And it is so cheap too! NOTES: For good Chinese, of course head down to Chinatown. 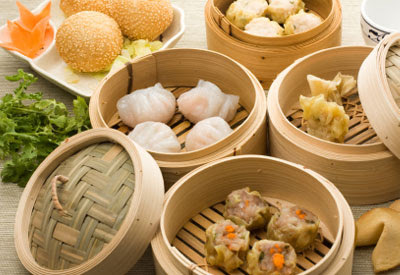 Try their soup dumplings. Yum! NOTES: If you live in New York and have not tried a weekend brunch at a dim sum joint, I shake my head at you. Go now. Try The Golden Unicorn. If you don't speak Chinese there is a bit of a language barrier, but don't let that stop you. Just point to trays as they roll by and ask to see what's inside before you accept. NOTES: Some of the freshest and most flavorful Mexican dishes I've tried. Try their Tostada de Ave as an appetizer. NOTES: Not the cheapest, but certainly delicious! NOTES: Hard to find, and minimal atmosphere, but very good (and cheap) authentic Vietnamese food.